Pancakes are such an integral part of American breakfasts. But I had never even tasted them till about a year ago. In Goa & Mumbai, the Catholics make pancakes on Shrove Tuesday, but those are British style pancakes- you know thin pancakes, served as a roll with sweet fillings like jaggery. The first time I tried American style was at McDonalds breakfast, over a year ago (they are served as hot cakes there). 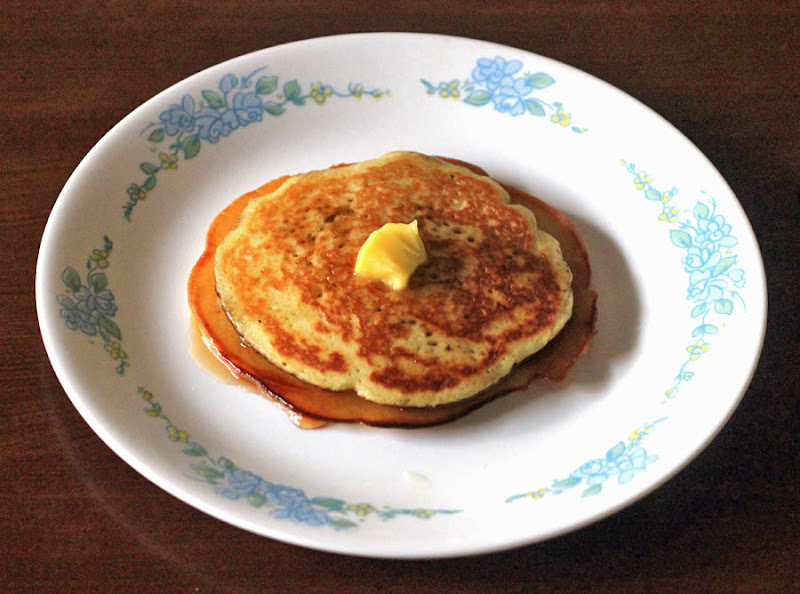 They are served simply, hot off the griddle with some maple syrup mixture & butter. It may not have been a foodgasmic moment for me, but I kept going back for the pancakes & really grew to like them. So a couple of months ago I decided to try making pancakes from scratch. Very few ingredients are needed, if you bake at home you will probably have all of them, at least I did. I sent my mom out to get maple syrup & she came back with that, plus Betty Crocker pancake mix (looks like she didn’t have faith in my cooking ability, I showed her!) I found the mix very annoying to work with, & didn’t enjoy the resultant pancakes at all. So after I was done with that horrible mixture, I made some of my own! One word? Delicious. Second word? EASY! I realize that many of you may have already tried this. But as I said, this is so awesome & easy that if even one of you feels inspired to try this (& does so!) after reading my blog, then my job here is done. 1. In a large bowl, sift together the flour, baking powder, salt and sugar. Make a well in the center and pour in the milk, egg,vanilla extract and melted butter; mix until smooth. 1. The original recipe called for a whole teaspoon of salt. I found it too salty for my taste. 2. The vanilla extract is my addition. It’s optional, but it really kicks things up a notch. 3. You know something I love about this recipe? The whole ‘make a well’ in the dry part of the mix actually minimizes a step (you don’t have to mix dry & wet ingredients separately!) One less bowl to wash is always a plus point in my book. 4. Don’t worry too much about melting the butter. If it’s hot where you live (like India is right now!) just keep the butter out of the fridge for 5 minutes & it will be soft enough to mix easily. 5. I don’t bother with measuring the amount of batter, I just pour. That results in unevenly sized ones but they’re just as tasty. If you want them slightly thinner you can try spreading the batter delicately just after you pour it. Here’s a close up photo. There’s maple syrup & butter on the pancakes. I called these ‘surprise pancakes’. Why? Because I coated the under side of the top pancake with nutella! Butter & maple syrup is the traditional way to go but there are so many other ways to serve it- nutella, compote, jam, preserve etc. It’s tastes great with some sliced fruits too like banana / apples. The possibilities are endless, just open up your fridge / pantry & experiment.